Courtney Bianculli ’13 learned via Facebook early Monday, Sept. 19 that a gunman was loose on campus. In the next 30 minutes, students expressed their confusion, fear and anger online. Was there one man? Two? Three? Did someone actually have a gun? Was the campus under lockdown? Were the men after someone in particular? Am I going to die? Even after campus wide emails had been sent to the student population, many do not know what actually occurred between midnight and one in the morning that Monday. So what is the real story? Shortly after midnight, Seminole County Sherriff’s Officers were pursuing a vehicle they believed was stolen during a shooting in Sanford. Three suspects ran to Winter Park, abandoned their vehicle, and fled the scene. According to Director of Campus Safety Ken Miller, the vehicle the suspects were in was not the car the officers had been originally pursuing from the Sanford shooting; the car simply had a similar description. Two men came onto campus near the soccer field off Fairbanks Avenue, while a third man, a passenger in the car, traveled north. This man never entered campus and is believed to have just been a passenger whom the police are not actively pursuing at this time. 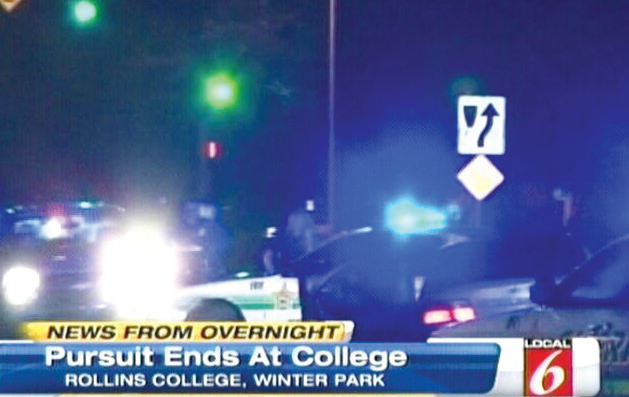 As soon as the two armed men stepped foot on campus, Seminole County officers, the Winter Park Police Department (WPPD), and Rollins Campus Safety worked together to solve the situation, sealing off all exits to the campus and shutting down Fairbanks Avenue. The two suspects were quickly apprehended, and two weapons were found on campus and turned over to WPPD. After additional security patrols of the campus by WPPD and Campus Safety, the campus received an all-clear at 12:50 a.m. Fairbanks reopened at approximately 1:45 a.m., and emergency response units did not leave the scene until 2 a.m. to ensure the safety of the scene. On Tuesday, another firearm was found by a Rollins staff member near the scene of the incident. It is believed to be related to the events of Monday morning. The incident itself raised a lot of conversation, but the larger concern amongst students was the way they found out: Facebook. Many students in public locations, like the Grille and the 24-hour lab in Olin Library, did not know anything happened until the next morning or much later that night. Where were the mass text messages promised in case of an emergency? Started in fall of 2007, according to the Rollins website, “the OUTREACH emergency notification system offers Rollins the ability to notify students, faculty, staff and parents of emergencies via phone and/or e-mail.” Upperclassmen received a text using this system during last spring break regarding a gas leak near campus. In order to stop this from happening again, administrators and Campus Safety met with the city of Winter Park Monday afternoon. The OUTREACH system has changed slightly, so that Rollins College now has full access to it. Currently, one individual on campus has the ability to send outreach messages to all students. In the near future, five administrators will have access to the system. In addition to the updated OUTREACH process, the same five people will have draft s of emergency-situation emails on their computers at all times which they can use to email the appropriate populations at a moment’s notice about any situation, so, should there be any issues with OUTREACH again, a backup system is in place.